Conservation easements are powerful and effective tools for the protection of natural assets on privately-owned land. They can be especially effective when used to complement other natural protection efforts by public entities, such as development regulations, preservation of publically owned undeveloped land, and even land acquisition by governments. 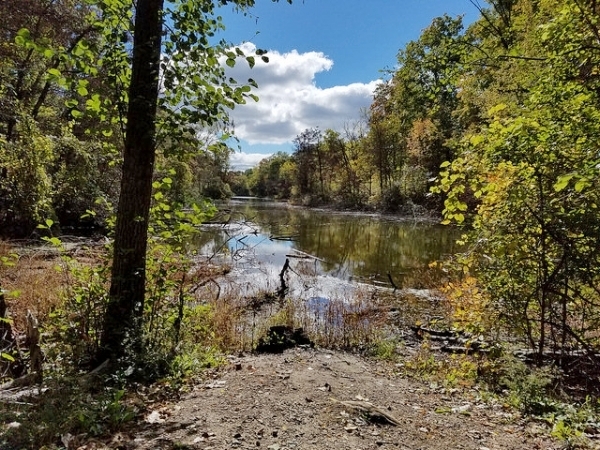 A conservation easement project in the Rouge River Watershed in western Michigan, which was initiated in 2004, now covers 270 acres of wetlands and adjacent forested uplands. These ecosystems are critical to sustaining the health of the Rouge River. Rogue River, Dearborn, MI. Photo by sharghzadeh via Flickr. The Rogue River Watershed covers over 167,000 acres of land mostly in Kent and Newaygo Counties, in western, central Michigan, and is a main tributary to the Grand River, Michigan’s largest river. Fragmentation of the natural landscape was a major threat to the river’s health. In 2004, a permanent conservation easement project was initiated in the Lower Grand watershed, with The Nature Conservancy acting as the easement holder. These efforts led to a conservation easement covering 270 acres, including wetlands and adjacent forested uplands and a quarter mile of frontage on the Rogue River. The wetlands play a significant role in reducing sediment loads and pollution levels of phosphorus and nitrogen. Habitat loss, alteration and fragmentation were major threats to the health of the Rogue River Watershed. Conservation easements restricted the degradation and fragmentation of wetlands and immediately adjacent lands. Fish and wildlife habitats were protected. Water quality was improved through reduction of sediments and nutrient loads. A scenic, open space was created. An additional measure for flood control was established, particularly for flash floods. The environmental benefits and other opportunities offered by conservation are often not considered by private landowners. However, most private lands cannot be set aside for conservation without the consent of the property owner. Clear benefits for private land owners can encourage conservation of land not only in the short-term, but also in perpetuity, as part of the deed to the property through a conservation easement. Land deeded as a conservation easement remains in the owner’s hands and can be used to meet the landowner’s needs. Aside from development rights and specific uses, the rest of property rights remains intact, allowing the landowner to benefit from the land in the form of certain recreational uses, ecosystem services, jobs, and economic activities. Conservation easements may enable the landowner to qualify for tax benefits in compliance with established rules. Conservation easements are a widely used tool for private land conservation in the United States. The Land Trust Alliance reports that the total acres conserved by local, state, and national land trusts grew to 47 million as of year-end 2010, an increase of about 10 million acres since 2005 and 23 million acres since 2000. Even though conservation easements do not necessarily provide public access, they can be used as a complement to other types of conservation tools, such as greenways. Although widely used, several challenges have to be overcome to ensure the successful implementation of conservation easements, including issues of permissible changes to the land, and evolving economic forces, community needs, and scientiﬁc information. Land trusts, managed by public or private entities or NGOs, are learning as they address these challenges and refining how conservation easements are applied. This case of the Rogue River Watershed shows an example of how the implementation of this tool reduced threats to the natural ecosystem, while providing financial benefits for private landowners.